Planet Downs was a 600 square mile cattle station (ranch) near a little town called Rolleston, Queensland. Unfortunately is has now been cut up into smaller blocks and even runs as a holiday resort complete with tennis course and a swimming pool. Back in the day it was noted for its wild cattle and good big horses. The only flat country with no trees was an airstrip which the owner used a couple of times a year during his visits. 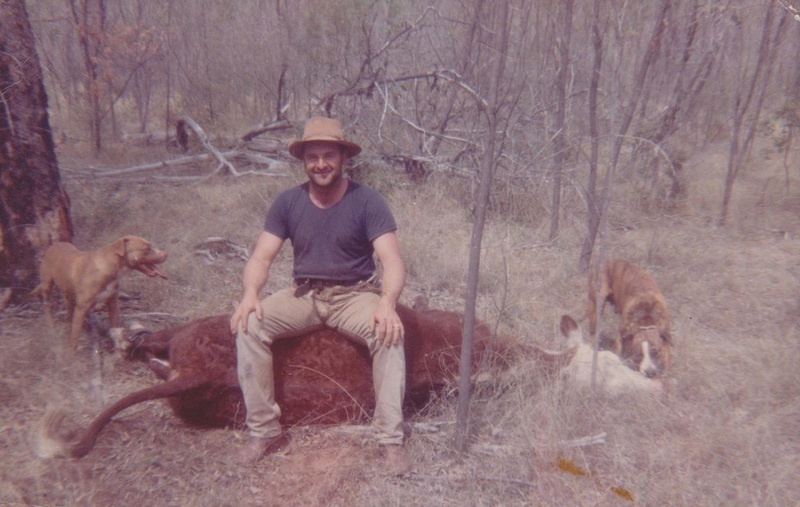 Neil Fullarton was the manager and he was a man who lived to run wild cattle. Neil is my father as you might have guessed and I do have some personal recollection of this following story. 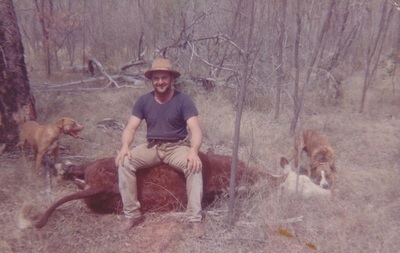 At one time the cattle dropped down in value and many of the other properties took to shooting the mickys (young wild bulls) instead of catching and selling them. Basically, it wasn’t considered financially viable to pay ringers (cowboys) to catch them. When faced with this, Neil wouldn’t do it as he said, it is the sheer challenge of catching mickys that makes this job worth doing. 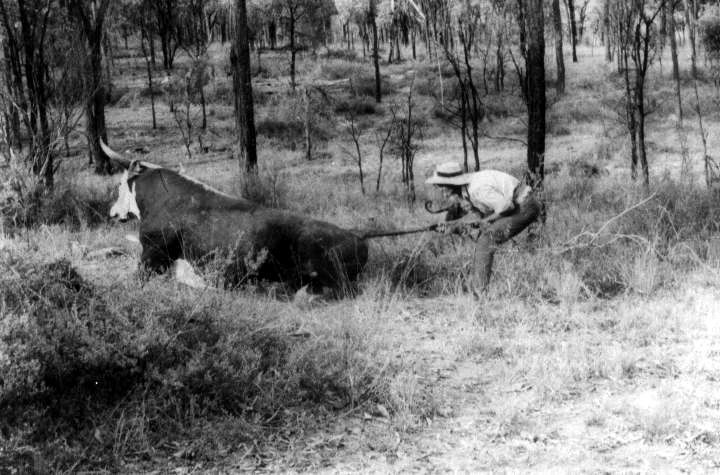 Scrubber runners (men who catch wild cattle) are defiantly a separate breed from other men in the bush. Let me tell you of a little incident that happened on Planet Downs when I was still a kid. Two young ringers had thrown a 4 year old micky bull but they couldn’t get any coaches back to him on the same day so they left him tied. As was usually, they left his horns because they were usually cut off just before you let him up to drive them towards the coaches. The truth be known, the ringers were also a little windy (scared) about letting him back up when he was fresh so they came into the homestead and spoke to Neil about their situation. He told them that he would go out the next morning and give them a hand. At that time Planet Downs had a horse breaker and we will call him Bobby Robinson. Bobby was a good horse breaker and Neil had brought him in to break horses as the station ringers were busy mustering and branding. Neil rode out next morning with the two ringers and Bobby went along as he wanted to give one of his breakers a ride out. 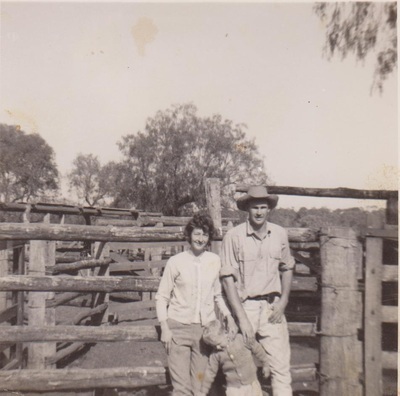 Bobby had little experience with wild cattle and he was instructed by Neil to not get off his horse under any circumstances as tied bulls can still get up and cover a short distance very fast. On the way out to the micky they picked up 10 or so quieter cattle that they were intending to use as coaches. As they neared the area they could see the micky lying down and as they came into view the micky hit his pins (stood up) and faced them with his head held high in the air. It was evident that he was still mad as a cut snake (If you ever hit a snake across the back with a stick you will know what I mean) so Neil told the ringers to just hold the cattle off about 50 yards. He also told Bobby to just stay out of the way while he went in to put the micky back down on the ground. Neil got off his horse and walked up to the bull in an effort to get behind him to grab is tail. The micky was looking at Neil and over to the coaches and slowly Neil was maneuvering around him waiting for his opportunity to run in and grab his tail. Imagine this scene. The micky was bellowing all this time in defiance and the snot was coming out of this nose and floating through the air like spider webs. Now, speed the scene up and add bull dust (very light dirt) all in the air. He was a short horn (breed of cattle) type of micky and as such possessed the type of Mexican fighting bull style of horns. All Neil’s attention was on the micky and he never noticed Bobby slip off his horse and tie him up at a safe distance. For a second the micky turned to face Neil and as he did, Bobby stepped in out of nowhere and grabbed him by the tail. A gutsy move no doubt but one that would prove almost fatal. Now, I have spoke before about the grip a ringer must have on a micky’s tail when he is throwing him this way. You wrap the brushy part of the tail once around your hand, hang on for all your worth and under no circumstance trip over you high heel boots or you are history. Bobby got hold of the tail all right but he never wrapped it around his hand due to his lack of experience. All of a sudden the micky lost complete interest in Neil and he turned to charge Bobby who was about to see his life pass before his eyes. As the micky came around the force pulled the tail from Bobby’s hands and there they were facing one another. The micky did not hesitate for a second and he charged Bobby who wasn’t quick enough to step around the side of him. The micky charged and as he got to Bobby he drove his left horn in Bobby’s groin. In the next second he threw his head in the air impaling Bobby over his head. 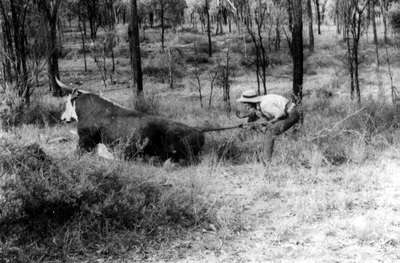 As this happened, the micky lunged and as it turned out, there was a Brigalow tree straight behind Bobby. The micky got Bobby up against the tree and proceeded to violently rub him up and down the tree and all this time bellowing in rage. Bobby was of course was yelling for his life and Neil tried to pull the micky back over by the bull straps on his hind legs. 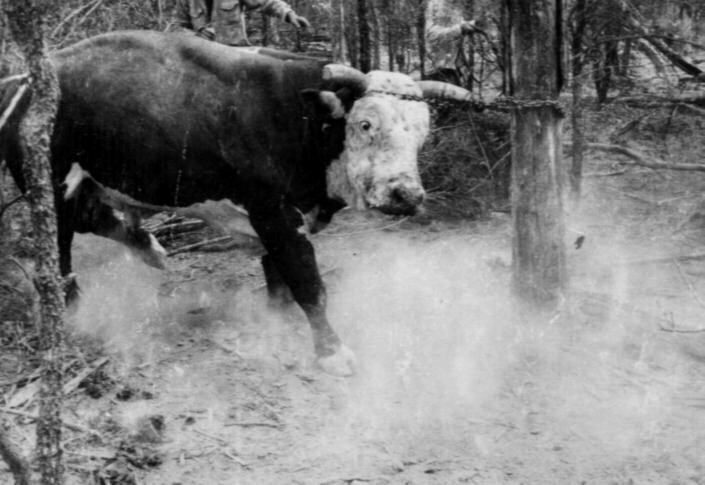 He found it near impossible as the bull was pushing off his back feet while trying to crush Bobby and the feet were buried deep into the dirt. Finally, while Neil had the micky’s tail firmly in his grip, he reached up and started hitting the micky over the side of the face with his hat in an effort to get him to lose interested in Bobby and turn around to charge him. Within a few seconds this succeeded and the micky turned his attention to Neil who stepped to the side as the micky set himself to charge. This was just enough to disengage his horn from Bobby which left him crumpled at the foot of the tree. As the micky charged Neil, he stepped towards his head making sure that he had the tail firmly in both hands. The micky was in kill mode at this time and as he came around to hook Neil, Neil pulled with all his might on the tail and the micky collapsed in a bawling heap in the dust. By this time the two ringers ran it and they tied his front legs while Neil was helping Bobby. The micky was relieved of his horns within minutes by one of the ringers. It was a horrendous injury to Bobby but luckily the horn did not strike the large artery on the inside of the leg. Still, the bull dust rapidly turn into red mud at the foot of the tree. One of the ringers rode for the homestead about 5 miles away as on this morning they were all on horseback. It was some time before the ringer returned in the landcruiser (brand of 4 x 4) and Bobby was loaded up and made as comfortable as possibly for his rough and fast ride back on the dirt track. By the time they had got him back to the homestead there was great concern for Bobby’s life as they had a hard time stopping the bleeding. They also made calls to the homestead on the two-way for them to get an ambulance sent out from town to meet them on the road. I recall vividly the scene that met me when they arrived at the homestead. The passenger side door was opened and being a small inquisitive kid, I walked over to look. I remember that there looked like a bucket of blood on the floor of the landcruiser and Booby was as white as a bed sheet. He just stared down at me and my mother grabbed my arm and pulled me away. They soon took off in the landcruiser leaving a dust trail only to be met by an ambulance half way to town. It was several hours before Bobby made it to the hospital but miraculously he lived and suffered no real side effects. 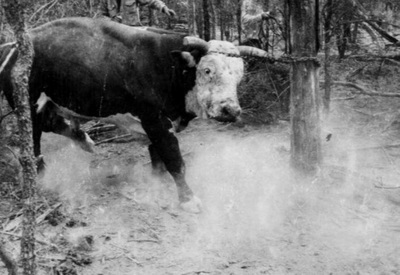 While running wild cattle, men were hurt constantly but this incident would be the top end of serious injuries. At one time, Planet Down cattle station sent a man to hospital, every week for 6 weeks straight. Everything from having an ear ripped off while galloping through timber to a broken wrist as a result of losing the battle with a fresh horse in the morning. Click on photos below for larger views.